Evidence of cancer has been found since the beginning of recorded history, with the oldest description of the disease dating back to around 3000 BC. While various advances in the understanding of cancer have occurred throughout the ages, it was in the mid-Eighteenth Century that Italian anatomist, . He accomplished this by performing autopsies to relate the patient’s illness to their pathologic findings post-mortem, thus allowing for the detection of cancer – albeit after death. It was not until World War II, however, that exposure to mustard gas led to the study of nitrogen mustard as a cancer treatment, ushering in the . The next four major milestones in the evolution of cancer treatment came roughly 20 years apart. 1960 saw the Philadelphia Chromosome identified in CML patients; this was the first genetic defect to be associated with cancer. Next came the 1977 approval of tamoxifen (the first targeted cancer therapy, binding to ER receptors), followed by the 1997 approval of rituximab (the first monoclonal antibody), and the approval of Provenge® (the first immunotherapy) in 2010. Today, however, advancements are coming thick and fast. According to information from HemOnc.org, we have gone from . As of March 2017, , while 33 biomarker tests used for drug selection have been approved in the US. Also worthy of note, February 2017 saw : Truxima™, the biosimilar of rituximab. The that, in the US alone, 2017 will see nearly 1,700,000 new cancer cases diagnosed and 600,000+ cancer deaths. Yet, given the incredible complexity of cancer overall, there is considerable variation regarding the specific cancer types contributing to these numbers. Fundamental differences exist in general incidence and survival rates by cancer type, and these rates are continually evolving as advancements are made in cancer screening and treatment. Ipsos Healthcare asked oncologists in the US (n=97), France (n=25) and Germany (n=25) what, in their opinion, were the cancer types most in need of new drug treatment options. Although, versus 2016, leukaemia increased in perceived need in both the US and EU countries (hereafter referred to as EU2), the main answer across regions was pancreatic cancer by a large margin. Moreover, pancreatic cancer is seen as having the greatest discrepancy between need and likely advancement, followed by brain cancer, HCC, sarcoma and gastric cancer. There is definitely hope, however. While many focus on lung and haematologic cancers, numerous drugs are being investigated for the cancers perceived to have the greatest need for treatment options, including pancreas (49), brain (58), and liver/HCC (35). And how are the anti-PD(L)-1s doing? The emergence of immunotherapy has helped to redefine cancer treatment. Even though we are now several years out from the initial launch of these agents, and expectations have been slightly tempered by real world experience, immunotherapy continues to generate considerable excitement. In our research, we found not only that clinical experience with anti-PD(L)- 1s is virtually universal in both the US and EU2, but that over 8 in 10 of our oncologists in both regions still spontaneously mention anti-PD(L)-1s as having “the greatest potential among new cancer treatments”. This is certainly supported by data from the Ipsos Global Oncology Monitor, which show continued growth of the anti-PD(L)-1 market since these drugs were first approved for use (see Figure 1). If any more evidence were needed, multiple outlets report Q1 2017 Opdivo® sales of over $1.1 billion, with Keytruda® at $584 million. So, what’s driving the ongoing growth of anti-PD(L)-1s? Simply put, it’s both new indications for existing products and approval of new agents. 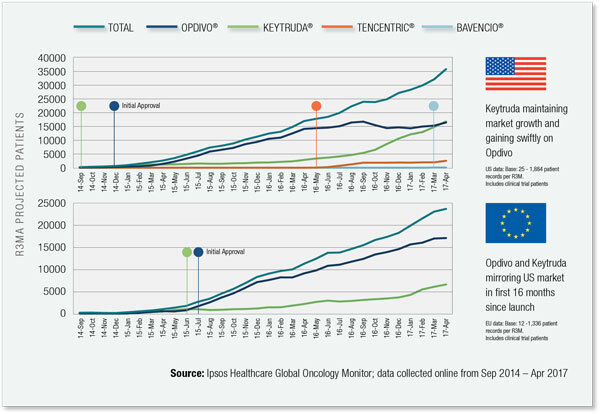 Since initial approval, both Opdivo and Keytruda have been approved for use in multiple cancers in both the US and EU. Likewise, approvals within certain cancer types continue to increase as data becomes available for use by biomarker status, for earlier treatment lines, and in combination with other agents. The impact of newer anti-PD-L1s is still largely unknown; in fact, in the US, where both drug classes are available for use, anti-PD-L1s are more often seen as distinct from anti-PD-1s. Interestingly, as seen in Figure 2, oncologists who perceive a distinction between the two drug classes and express a preference are more likely to prefer the newer anti-PD-L1s. 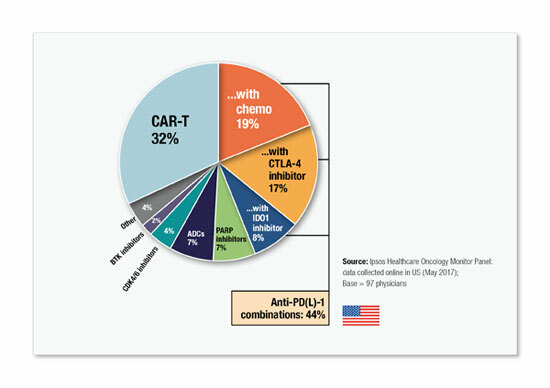 While anti-PD(L)-1s are the stars of today, there are yet more advancements on the horizon, with the most immediate being the continuing evolution of anti-PD(L)-1s and the looming availability of CAR-T technology – which has the potential to redefine the current treatment landscape. Looking even further ahead, we can see the advent of the new I-O therapies, including anti-ICOS(R) drugs, BiTE (Bi-Specific T-cell Engagers), DART (Dual Affinity Re-Targeting), and NK -1 (Natural Killer Cells). Clearly, the next step in the evolution of anti-PD(L)-1 agents is combination use. . To put some numbers to this, combination studies using Keytruda went from 70 in 2015 to 268 in 2017. For Opdivo, the figures were 73 and 242, respectively. 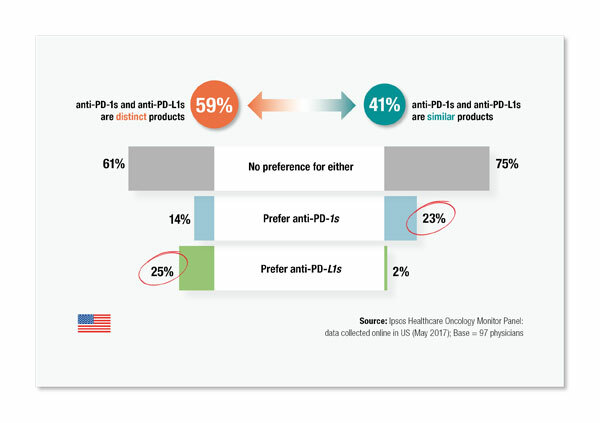 Ipsos’ research respondents in the US confirmed the buzz surrounding anti-PD(L)-1 combinations, with nearly half (44%) stating that they are most excited about these options (see Figure 3). Enthusiasm for anti-PD(L)-1 combinations with chemotherapy has only been heightened with the recent US approval of Keytruda in combination with pemetrexed/carboplatin for the frontline treatment of metastatic nonsquamous NSCLC. Meanwhile, CAR-T therapies are likewise generating considerable interest, despite the onerous manufacturing process, logistical limitations in securing facilities capable of administering, and unknown reimbursement challenges. And the first critical hurdle to bringing these therapies to market has just been cleared with the recent unanimous FDA vote in favour of Novartis’ offering. And what drives this excitement? Regardless of the anticipated new cancer therapy, the reason is clear: efficacy, efficacy, efficacy! It remains to be seen if these new options will live up to the hype, but trial data so far has been encouraging. Following the mention of efficacy, physicians are also intrigued by the novel MOAs of these future options. Of course, how treatment is determined is also evolving, with new markers and metrics emerging. When asked which factors will influence treatment decisions moving forward, nearly half of physicians (44%) cited MSI status as being ‘very influential’ – an understandable perception given the recent and unprecedented tumour-agnostic approval for Keytruda in the US, based on MSI result. Physicians additionally anticipate Tumour Mutation Burden to be ‘very influential’ (31%) and, to a lesser extent, NTRK (Neurotrophic Tyrosine Receptor Kinases) Gene Fusions (18%). On an unaided basis, physicians also mentioned the increasing influence of genomic profiling/specific mutations (24%) and PD-L1 OE (23%). This ties into . Now that immunotherapy has been embraced as a standard option, the next step – 2.0 – involves not only expanding its use, but refining patient selection in order to maximize benefit. We are already seeing evidence of this occurring. 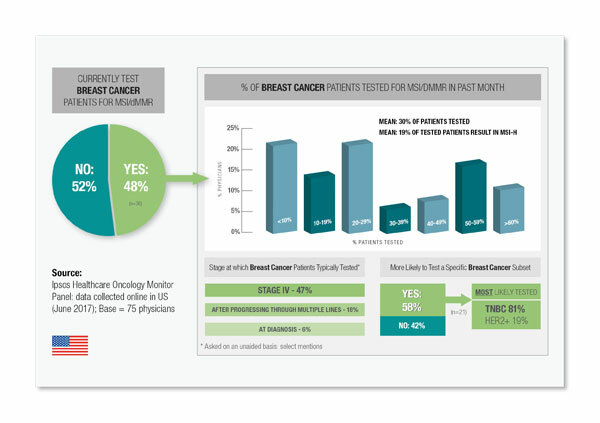 In separate research conducted by Ipsos Healthcare in June 2017 among US oncologists (n=75), nearly half (48%) indicated that they are already testing for MSI/dMMR in breast cancer. This allows physicians another means of tailoring treatment to appropriate patients, especially those with hard to treat triple negative breast cancer (see Figure 4). Which oncology companies are leading the way? In both the US and EU2, our oncology panel physicians consider Roche/Genentech to be the leader in oncology research and development. Although its anti-PD-L1, Tecentriq®, launched substantially later than Opdivo and Keytruda, Roche/Genentech’s considerable oncology portfolio and strong pipeline keep it at the forefront of perceived innovators. BMS follows, based on the early success of its anti-PD-1, Opdivo. Although perceptions of MSD/Merck lagged behind BMS at the time the research was conducted, a recent series of rapid approvals for its anti-PD-1, Keytruda, are likely to enhance perceptions. Novartis rounds out the top four companies mentioned for its ongoing dedication to cancer treatment. As of the end of March 2017, data from Friends of Cancer Research reveal that . Of these, 32 cancer drugs have achieved FDA approval. Unsurprisingly, the companies perceived to be leaders in oncology R&D have secured the greatest number of breakthrough therapy designations. Yet, despite all the answers we are still seeking, we’ve come so far since the initial discovery of anti-cancer drugs, and in a relatively short space of time. The pace of advancement has never been more rapid than it is today. The future is very exciting – will the next generation treatments finally enable us to triumph in the fight against cancer…? This paper incorporates data and information from the Ipsos Global Oncology Monitor, the Ipsos annual ASCO perceptual questionnaire*, the Ipsos MSI assessment** and other third party sources. All data was collected online. Jackie Ilacqua & Valerie Wriede, The Ipsos Healthcare Oncology Centre of Excellence.